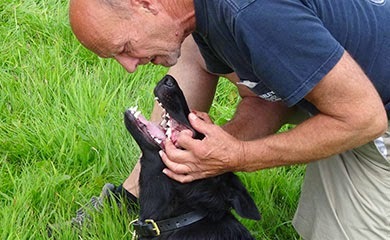 On Sunday 3rd August we all met up for our fortnightly training session held in the fields and woods behind the Woodside animal sanctuary in Plymouth. 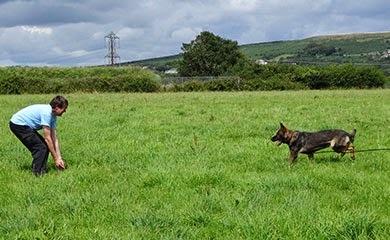 We ran a light hearted competition assessing all the 8 pups from the B litter in 10 areas of skill. 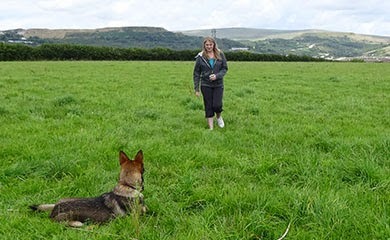 The main objective we want to achieve with our puppy walkers is that they enjoy their pups and give them as wide a socialisation programme as they can. 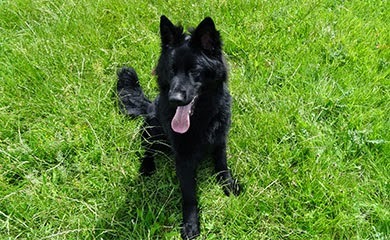 Training is voluntary but since we have been running the fortnightly development programme all the walkers like to be given some elements of training to keep their pups active and mentally challenged. Here are our 8 contenders. 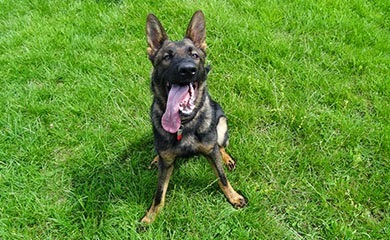 No expense was spared by the force with a boiled sweet awarded to the puppy walkers for every successful task they performed. If they were not happy with a boiled sweet they had the alternative of an opal fruit or sherbet. Here are the tasks they had to perform. 1. 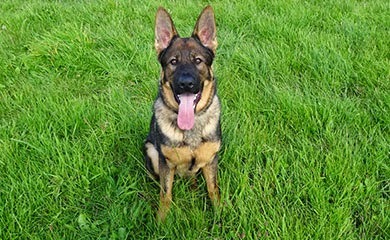 RECALL TO HANDLER. 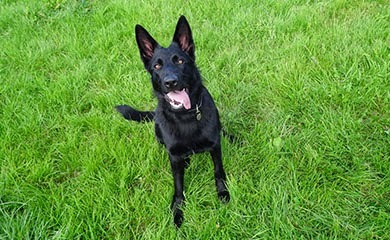 A fast happy recall was required with the dog restrained by me and the handler called their pup from 30 metres away. This was then repeated while the dog was freely investigating doggy smells. 2. RETRIEVING THE TOY BACK TO THE HANDLER. 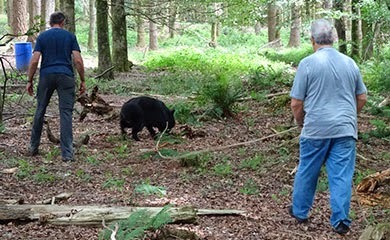 The puppy walker held their pup while I threw a ball on rope 20 metres away and the pup was then released and required to bring it back to the puppy walker. 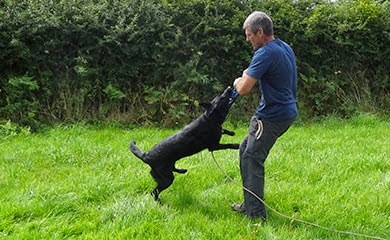 On the day no one managed to do a full retrieve to hand and so I thought I would demonstrate with Yogi who has been with me for the last 5 weeks while his puppy walkers are in New Zealand. 3. 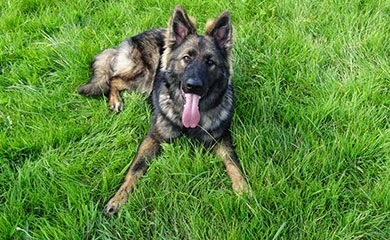 DOWN STAY . 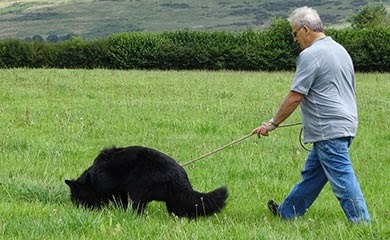 The dog was required to be placed in the down stay position and the handler had to walk 10 paces away then return to the dog and kneel down alongside the dog without the dog moving from the down position. Pictures above show Lindsay placing Buddy in the down, leaving him then returning and rewarding him. 4. SIT AND FOCUS. The puppy walker was required to have their pup sat in the heel sit position and obtain 5 seconds of eye contact. 5. VETS EXAMINATION The puppy walker was required to show they were able to examine their dog’s ears, teeth and underbelly as if being examined by a vet. Colin examining Beckie’s teeth and underbelly a vitally important exercise as we want the dogs to relax at the vets. 6. TUGGING TENACITY . 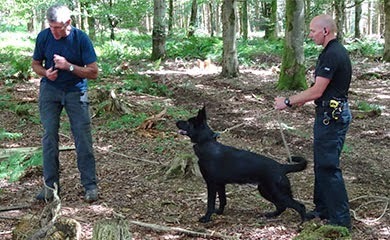 This exercise was conducted to assess how much determination and desire to bite and win each dog had. Beckie showing real determination to win the tugger. 7. CONFIDENCE IN DEALING WITH AN UNUSUAL SITUATION. 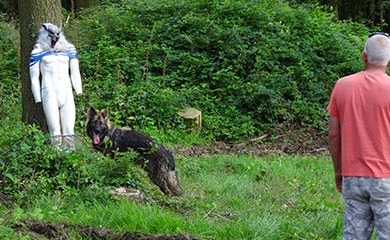 Each dog was taken into the woods where a strange dummy was leaning against a tree. 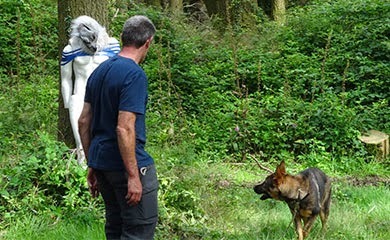 We wanted to see if the dog was confident enough to approach and investigate the figure. 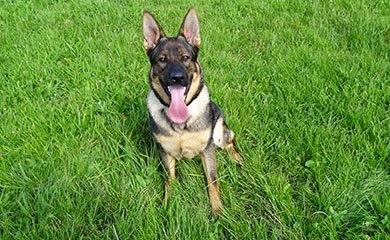 If the dog shows fear it is acceptable provided the pup recovers with encouragement. Only 2 pups showed any caution towards the dummy but they quickly recovered and investigated. Blade Looking at dad saying this is an interesting chap dad. 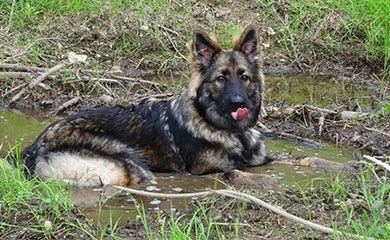 Blade being so bored by the scary figure he decided to go over to a muddy pool nearby to lie down much to the disgust of his puppy walker Emma. The above pictures show Brodie spotting the figure from distance he slowly approaches and tentatively examines the figure. 8. SEARCHING FOR ARTICLES HIDDEN IN THE WOODS The dogs were required to search for and locate an article after seeing it thrown into the woods. This was repeated with 2 more articles. Article 1 was a leather glove, article 2 was a wallet and article 3 was a shotgun cartridge. 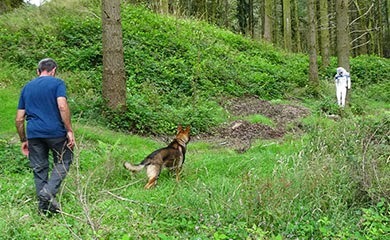 The above shows Boris searching and locating the shotgun cartridge. 9. 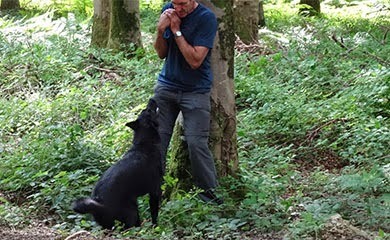 SEARCHING FOR A PERSON HIDING IN THE WOODS The dog was restrained by the puppy walker while the helper ran off and hid behind a tree. The puppy had to run after the helper and bark at the helper for his/her toy reward. The above shows Beau watching the helper going off to hide. The above shows Bebe barking at the helper after finding him. 10. FOLLOWING THE TRAIL LEFT BY THE HELPER The dogs were required to follow and locate 6 food drops placed on a 30 metre long trail in a field. 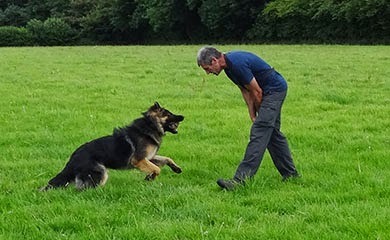 The above shows Boris tracking with a very low nose with intense concentration. 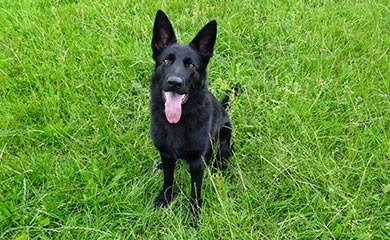 Considering the dogs have another 6 months before their Police dog course they are all at a very good standard and our puppy walkers should be congratulated. Best overall performance was between Buddy and Beckie but in the end Beckie’s superior stamina saw her perform at a very high level throughout and she had a surge on the last 3 exercises where as Buddy started to flag on the home straight. So overall winner was Beckie. 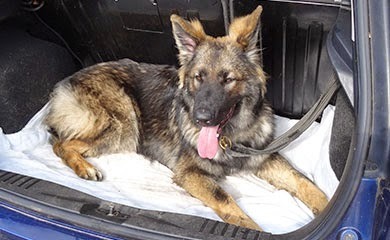 I think everyone had a good day and if there was an award for lying down it would go to Blade seen above getting ready for the drive home. I am off to buy some extra boiled sweets to hand out on our next training session as I underestimated how good they all were. 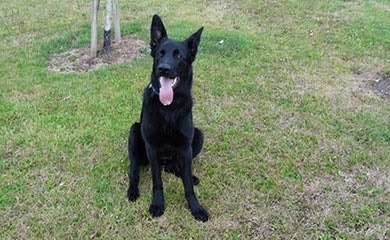 See you next time when I will let you know who will be starting on the September 2014 Initial Police dog course.